The iPad Air is seeing five times the usage the iPad 4 did two days after launch and more than 3 times that of the iPad mini, according to a report from Fiksu. After the opening weekend a year ago, the iPad 4 had just 0.14% of activity, and the iPad mini had 0.21%. Combined the iPad 4 and iPad mini saw 0.35% of usage after the launch weekend; whereas, the iPad Air is now making up 0.69% of active iOS tablets using apps in Fiksu's network. The real kicker is that the growth of the Air is just getting started. 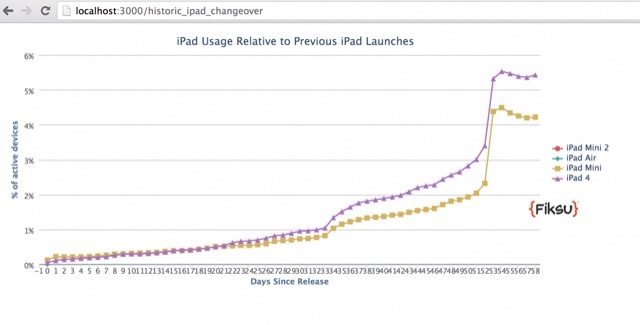 Take a look at the adoption rates of last year's iPads plotted out through the end of the year. The data shows slow growth through November, with a small bump after Thanksgiving/Black Friday and then a huge spike Christmas Day. If the iPad Air follows the same general trajectory from this accelerated start, then Apple CEO Tim Cook's prediction that "it's going to be an iPad Christmas" isn't going to be in much doubt.